Rebekah Higgitt completed a PhD in the history of science at Imperial College London in 2004 and did postdoctoral research at the University of Edinburgh. She was Curator of History of Science and Technology at the National Maritime Museum and the Royal Observatory, Greenwich between 2008 and 2013 and is now a senior lecturer in the School of History at the University of Kent. Her research and publications have mainly focused on scientific institutions, scientific biography, history of science and the relationship between science, government and the public in 19th-century Britain. Yesterday, a Blue Plaque was unveiled to the botanist, and philosopher and historian of botany, Agnes Arber (1879-1960). This event both paid tribute to a pioneer who made a significant mark in her field and reflects the English Heritage scheme’s ambition to increase the numbers of women and other under-represented groups commemorated by its plaques. I am a member of the Blue Plaque panel and was delighted to lead the speeches at the unveiling in Primrose Hill. The new English Heritage blue plaque, unveiled in Primrose Hill on 1 November 2018. An edited version of this book review appeared in the latest issue of British Journal for the History of Science (vol. 49, 2016, pp. 529-30). Govoni, Paola, and Franceschi, Zelda Alice (eds. ), Writing about Lives in Science: (Auto)Biography, Gender, and Genre. Goettingen: V&R Unipress, 2015. Pp. 287. ISBN. 978-3-8471-0263-2. €44.99 (hardback). Biography within the history of science has repeatedly been rescued, revived and reconsidered: from Thomas Hankins’s 1979 ‘Defense of Biography’, to the essays in Telling Lives in Science (1996, eds. Michael Shortland and Richard Yeo), the 2002 workshop that led to The History and Poetics of Scientific Biography (2006, ed. Thomas Söderqvist), the 2006 ‘Focus’ section in Isis and now this collection. Many of those who have written biographies have been reflexive about their motivations and their version of their subject’s life and character. Richard Westfall, for example, produced some fascinating reflections for the 1985 collection Introspection in Biography, showing the wisdom of B.J.T. Dobbs’s comment that Newton is “something of a Rorschach inkblot test” for historians (Isis 85 (1994), 516). Those academic biographies of major figures have, after all, still been produced and, as Margaret Rossiter and Pnina G. Abir-Am led the way from the 1980s onward, so too have collections and considerations of lives of women scientists. I am currently revising a paper on the early history of the Royal Society’s Copley Medal for publication. I told part of this story in a post one the H Word Guardian Science blog. Although it is tangential to my main story, because I am particularly interested in the materiality of the medal scheme I would like to trace extant Copley Medals and would be grateful for any help readers can give me. I am looking particularly for copies of the medal that were made from the original die that was engraved by John Sigismund Tanner at the Royal Mint (his signature ‘T’ is visible on Athena/Minerva’s plinth). One of the very earliest is that given to John Belchier (below, now at the British Museum) – it was awarded in 1737 but he only received the medal after copies were first struck in 1742. 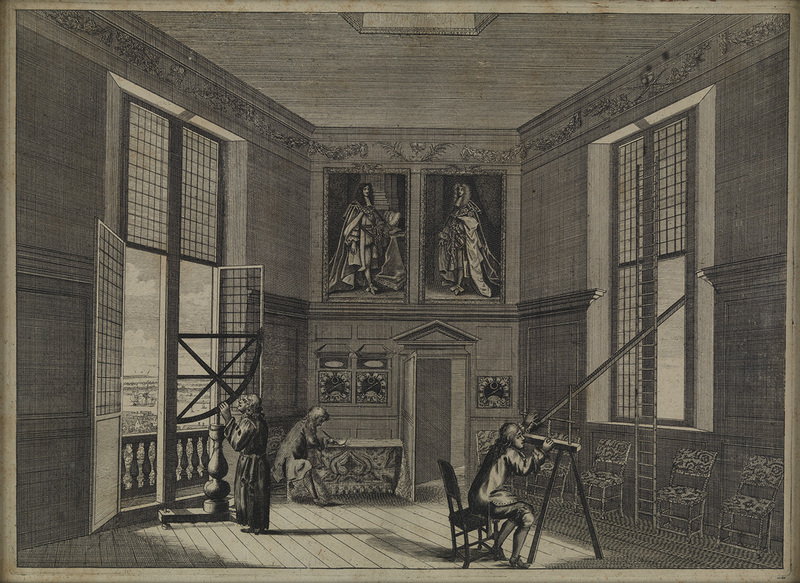 Earlier this month I published a post at the H Word on ‘Halley’s Eclipse’ of 1715. It has been associated with Edmond Halley because, using the best theory and data then available, he made impressively accurate predictions of its timing and path, publicised through a broadsheet map and the Royal Society. As I explain in the post, however, he was not the only one to do so: London was a competitive market for scientific publications and authority. This post is an appendix, where I can show more of the eclipse maps published than I could on the Guardian’s website. I should add, too, that these were not the first predictions or maps of solar eclipses, and that there were earlier German, Dutch and French maps. Here, however, is Halley’s first map, from Eclipse Maps, which was published in advance of the event, encouraging observation. It is titled “A Description of the Passage of the Shadow of the Moon over England, In the Total Eclipse of the Sun, on the 22d Day of April 1715 in the Morning”. I am not sure where the original is kept, but it may be the same as that reproduced in black and white in Jay Pasachoff’s article on Halley’s eclipse maps, which is from the Houghton Library. The full text, which is not high enough resolution to read here, has been transcribed by Pasachoff. 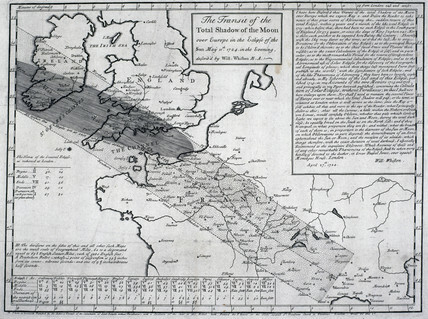 Halley’s predictive map of the 1715 eclipse, from Eclipse-Maps.com. Halley seems to have produced more than one edition of the map before 22 April 1715 (O.S. – the anniversary was celebrated on 3 May N.S. ), and also one after the event, showing the path as corrected by observations. 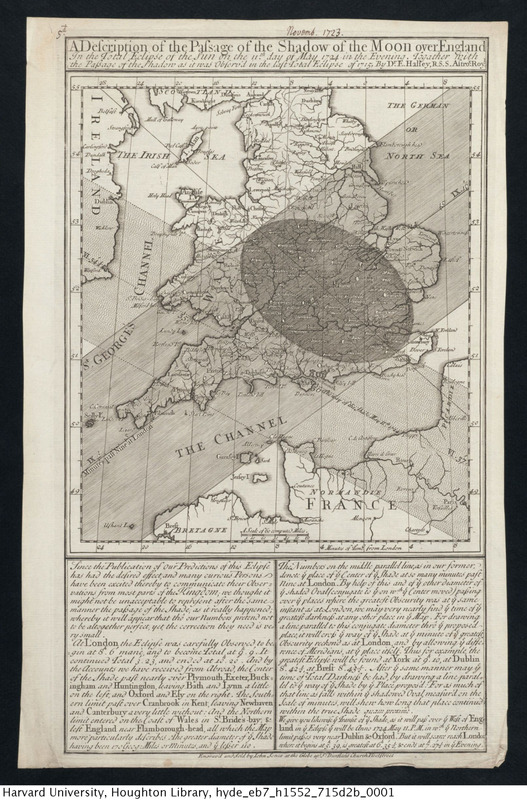 This copy of his “A Description of the Passage of the Shadow of the Moon over England as it was Observed in the late Total Eclipse of the Sun April 22d, 1715 Manè” is from the Institute of Astronomy, University of Cambridge, where you can see some superbly high-resolution images. Halley came back to his winning formula when another eclipse rolled along. His map, published in 1723 (annotated November 17123 here), showed both the recomputed path of the 1715 eclipse and the predicted path of 11 May 1724. This image is from the Houghton Library’s Tumblr, where it is available in higher resolution. The text declares that the first map “has had the desired effect” in encouraging observation and uses this one to demonstrate that his predictions had been pretty good in 1715 and were worth acting on again. 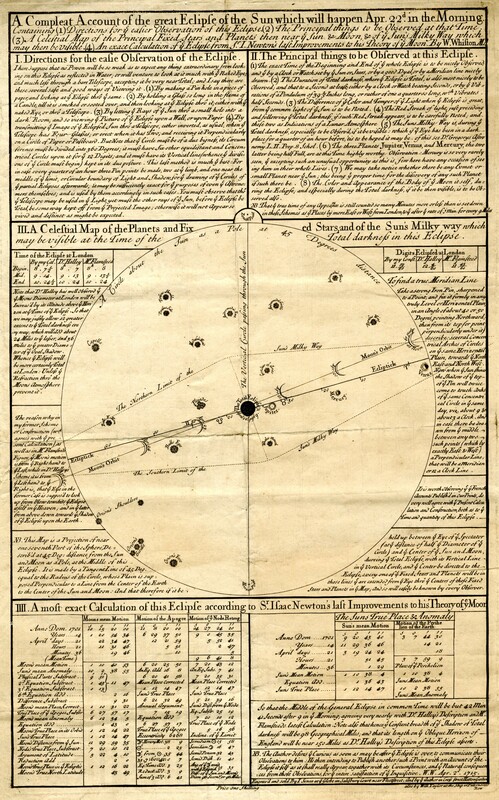 Halley’s map showing the 1715 and 1724 solar eclipses. Houghton Library (EB7 H1552 715d2b). However, as my post discussed, William Whiston was also in the business of predicting eclipses and selling scientific paraphernalia. Like Halley, he was making predictions based on John Flamsteed’s observations at the Royal Observatory and corrected with Isaac Newton’s theory, and encouraging observations. Whiston made comparison of his observations with Halley’s and his two eclipse-predicting broadsheets are again from the Cambridge Institute of Astronomy’s Library here and here. The one I think is the earlier from Whiston was dated 2 April 1715 and titled “A Compleat Account of the great Eclipse of the Sun which will happen Apr. 22 in the Morning”. It is much more text-heavy and technical in content, and the map is a celestial one, showing the positions of the heavenly bodies rather than the path of the shadow on Earth. Whiston’s broadsheet predicting the timing and path of the 1715 comet. Institute of Astronomy, University of Cambridge (AMI/11/B). A second broadsheet by Whiston did show the Sun’s shadow on the Earth, but from a global point of view. The title too emphasised that this was not just an English matter: “A Calculation of the Great Eclipse of the Run, April 22d 1715 in ye Morning, from Mr Flamsteed’s Tables; as corrected according to Sr Isaac Newton’s Theory of ye Moon in ye Astronomical Lectures; with its Construction for London Rome and Stockholme”. It also advertised an instrument that could be bought from Whiston. 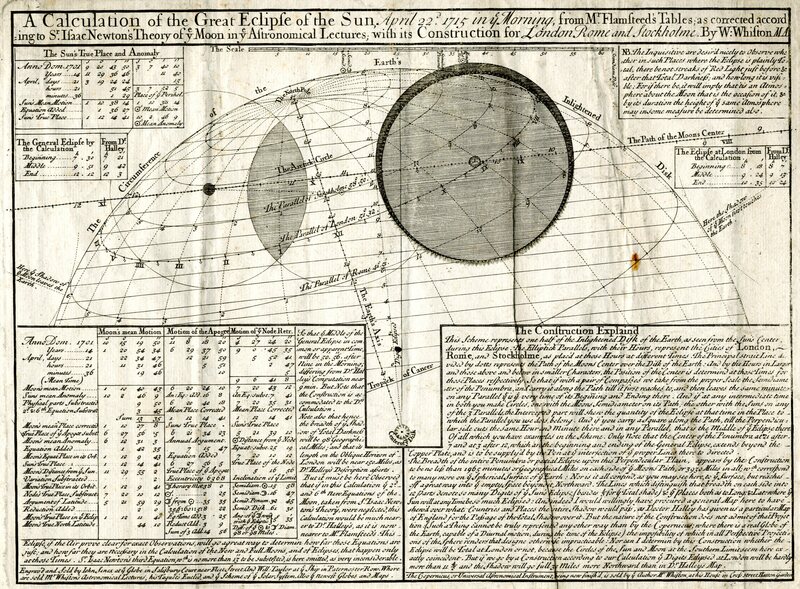 Whiston’s second 1715 eclipse broadsheet. Institute of Astronomy, University of Cambridge (AMI/11/C). John Westfall and William Sheehan’s new book on observing eclipses, transits and occultations, indicates the Whiston and Halley’s estimates varied by about 25 miles, which perhaps puts the more triumphant claims of accuracy in perspective. I think (correct me below if I am wrong) that Halley’s prediction was the more accurate, but there was an element of luck involved. 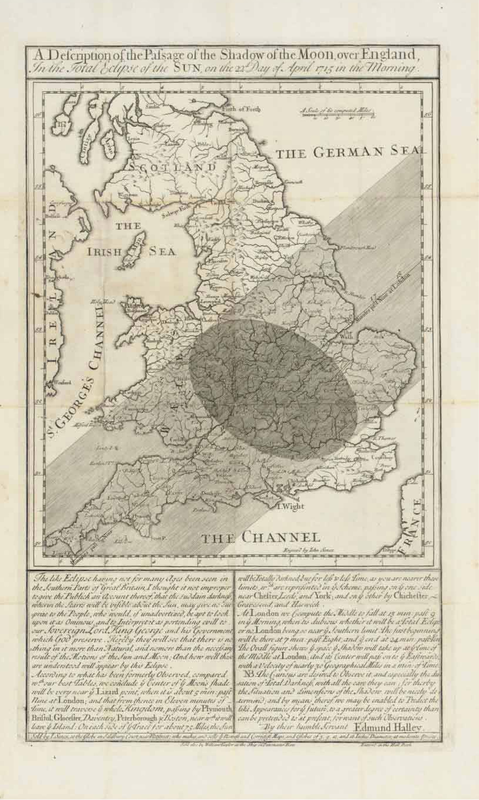 Above all, his map, showing geographical detail of England beneath the path of totality, was much more persuasive and appealing – this is the main reason that the 1715 eclipse became ‘Halley’s’. Whiston had learned the importance of the image by 1724. His “The Transit of the Total Shadow of the Moon” this time showed familiar coastal outlines, although again other parts of Europe were included: Paris would be a better observing site than London this time. This version is from the Science & Society Picture Library and belongs to the Royal Astronomical Society. 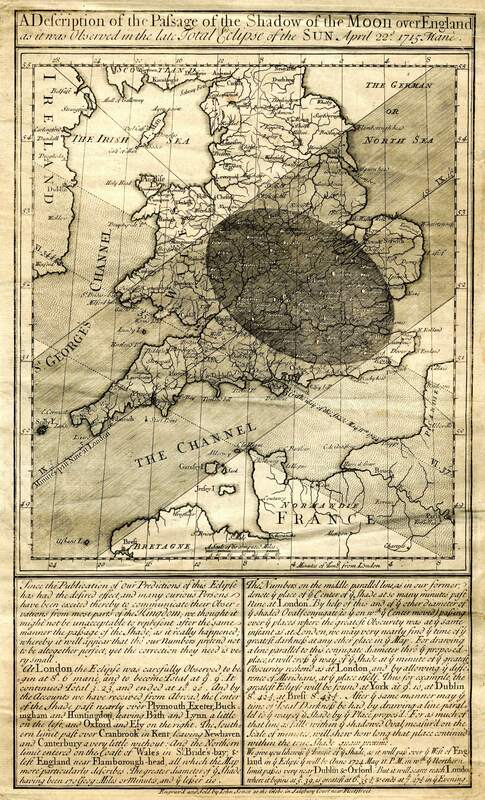 Whiston’s map showing the predicted path of the 1724 eclipse. Science & Society Picture Library/Royal Astronomical Society. And so the maps continued: there are many to explore in the wonderful albums at Eclipse Maps. It was a flourishing business come eclipses in the 1730s and beyond, especially that of 1764, as many publishers jumped on the opportunity that Halley and Whiston had spotted in 1715. So too, of course, had the person that links all the images shown here: the engraver and cartographer John Senex, who deserves a much fuller biography on Wikipedia than this! Real, replica, fake or fiction? 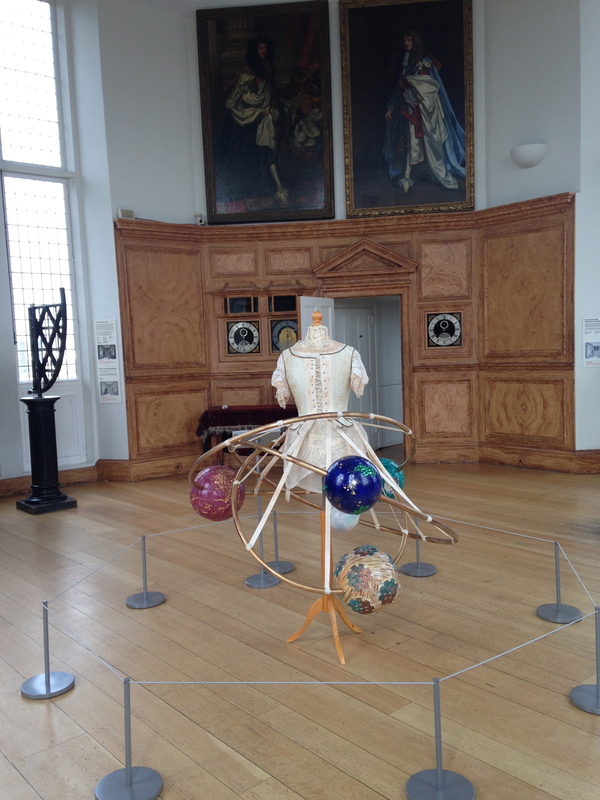 When we allowed a Steampunk ‘intervention’ into Flamsteed House and the Time and Longitude Gallery at the Royal Observatory Greenwich last year, in the exhibition Longitude Punk’d, reactions were varied. Many were really positive about bringing some imagination and artistry in to explore the themes, objects and spaces and we undoubtedly attracted at least a few visitors who might not otherwise have gone. There were, however, more than a few staff and visitors who were annoyed that we were mixing fact and fiction and taking away the authoritative voice of the Museum. How would people learn anything? How would they know what was real history and which were the real objects? Either proving or entirely dismissing their point, most visitors, particularly tourists there for a photograph on the prime meridian, probably didn’t even realise that they were not seeing a straight forward exhibition. What those who worried about ‘reality’ perhaps don’t fully appreciate is the extent to which fictions and fakes are always a part of museum displays. It is the joy of something like this exhibition – or the really wonderful Stranger than Fiction exhibition at the Science Museum – that they force you to think harder about what we’re presented with and how we too blindly trust the authority and ‘reality’ of certain modes of presentation. For me, this photograph I took in the Royal Observatory’s Octagon Room during Longitude Punk’d nicely brings out some of what I mean. While, even for the non-too eagle-eyed, it is clear that the dress in the centre, created for Longitude Punk’d, is not 18th century, for most visitors it might appear that this is a modern piece, with historical nods, simply dropped into a 17th-century space. It is a fiction dropped into history. But things are not what they seem. Firstly, of course, we can note the museological trappings that make this space very different to the one that John Flamsteed knew. There are barriers, electric lights and museum labels, also a smooth, light wood floor. But what of those paintings? The instruments? The clocks and panelling? What we have is a mixture of ‘original’ pieces, later historic objects, 20th-century replicas and 21st-century recreations. The room, much altered over the years, has been completely recreated. The engraving doesn’t give us much information on the nature of the panelling, but restoration work on the rooms downstairs suggested that a fake wood effect had – at least there – been an early wall treatment. Thus an original ‘fake’ effect has been ‘authentically’ recreated, possibly in the wrong space. The astronomical quadrant, on the left, is a ‘real’ historic object, but some 75 years too late for this set-up. The telescope on the right (out of sight in my picture, but recreating the one in the engraving) is pure prop, without lenses. It used to offer those who bothered to take a look a view of a faded slide of Pluto (the cartoon dog). Now, after much effort of the sort that only those acquainted with the pace of change in large museums will appreciate, it has a picture of Saturn (the planet), fuzzed and chromatically distorted to give some sort of idea of what it was like looking through an early telescope. Obviously Saturn ain’t really visible, through the windows, in the daylight. What of the paintings? Well, the rather splendid portrait of Charles II (left) is from 1670. I assume (correct me if I’m wrong – annoyingly the catalogue entry doesn’t give the provenance) that this has stayed at Greenwich, if not this room, throughout the centuries – it is certainly similar to the one in the engraving. However, for the purposes of this post we should note that it is nevertheless “thought to be a copy of a Lely”. The engraving also shows us a painting of the Duke of York, later James II, who had been, perhaps significantly, Lord High Admiral until 1673. However, the one that is currently there is in fact a commissioned replica from 1984. I have no idea what happened to the (copy?) Lely of James that was originally there. Did Charles survive and not James because of an anti-Catholic Astronomer Royal (nearly all of them, I reckon, before the 20th century)? Answers below, please. The clocks, originally by Thomas Tompion, are perhaps the most complex story of all. Again, what’s in the two images appears to match but that’s about where it stops. Famously, after Flamsteed’s death his wife Margaret sold off the books and instruments at the Observatory, fairly seeing them as private property since they had either been bought by or gifted to Flamsteed. The clocks, therefore, left the observatory. Today, one of the clocks is back, but on the other side of the room. That is because it was altered and its original 13-foot pendulum changed so that it could be turned into a longcase clock. The clock, with the original dial fitted into an 18th-century wooden case and its mechanism on display in a late 20th-century glass case, is a completely different beast. Next to it is a (wonderful) interloper: a Tompion longcase, which only moved to the Observatory in 2010. There we have it. The most original thing in the room are some holes behind the skirting.